This City Law School alumnus is currently the Director of Legal Services for the Royal Air Force (RAF) and Head of its Legal Branch. 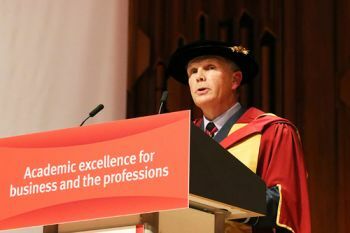 City, University of London alumnus, Air Vice-Marshal Lindsay John Irvine, was awarded an Honorary Degree of Doctor of Laws in recognition of his contribution to the legal profession, during the University's recent graduation ceremonies. Air Vice-Marshal Irvine has been the Director of Legal Services for the Royal Air Force and Head of the RAF Legal Branch since 2009. In those roles he is the principal legal adviser to the Chief of the Air Staff and general counsel to the Air Force Board of the Defence Council, the body commanding the RAF. After attending Robert Gordon College in Aberdeen, he gained admission to Oxford University, graduating with a degree in Classics Greats in 1981. Air Vice-Marshal Irvine went on to successfully study for the Graduate Diploma in Law at what was then City University London's Centre for Legal Studies, before completing the Bar Vocational Course at the Inns of Court School of Law (ICSL) in 1982. He was called to the Bar in 1983. The Centre for Legal Studies and the ICSL would together form The City Law School in 2001. Following a brief period in private practice, he joined the Royal Air Force, graduating from RAF College Cranwell in 1986. He has served in various advisory, policy and operational legal appointments in the UK and overseas, including court-martial prosecution and defence advocacy roles and the provision of advice on the extraordinarily varied legal topics which affect the Armed Forces, from employment issues to Space law. Throughout his career he has lectured to military staff colleges and organisations on International Humanitarian Law, administrative and public law and military and civil aviation law. Among Air Vice Marshal Irvine's military career highlights, he pioneered the role of the legal adviser in air operations at the Permanent Joint Headquarters and Joint Force Headquarters Staffs, which included co-authoring a new edition of the UK National Rules of Engagement Manual, and as a member of the Parliamentary Bill team, he assisted in the development of the Armed Forces Act 2006 which governs the three armed forces. He has found RAF service an immense privilege and a great source of enjoyment with a particular highlight, perhaps uniquely for a lawyer, the opportunity to fly on a variety of frontline aircraft including the supersonic Tornado. In 2003, he attended the Royal College of Defence Studies and acquired an MA with Distinction in International Relations from Kings College, London. As Director of Legal Services, he has led the transformation of his Branch from a role largely concerned with court-martial cases and service discipline to one with an operational and international public law focus. He was elected a Fellow of the Royal Aeronautical Society in 2009 and is a member of the Society’s Air Law Group. In 2014, he was made of Companion of the Bath (CB).